Fifty senators wrote NFL Commissioner Roger Goodell to officially call on the Washington franchise to change its team name from the Redskins. “We urge the N.F.L. to formally support a name change for the Washington football team,” the letter read. The senators said the team name is offensive to Native Americans and served as a “racial slur.” “The N.F.L. can no longer ignore this and perpetuate the use of this name as anything but what it is: a racial slur,” the letter read. “Today, we urge you and the National Football League to send the same clear message as the NBA did: that racism and bigotry have no place in professional sports,” the letter read. 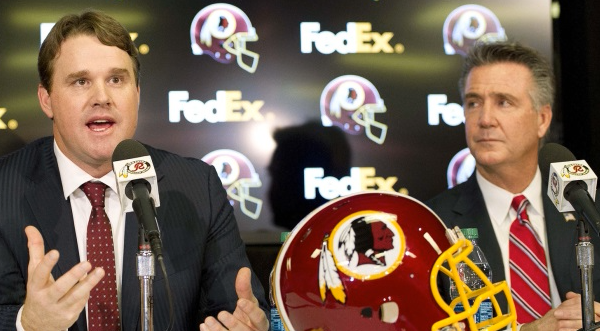 “It’s time for the NFL to endorse a name change for the Washington, D.C. football team. Just five Democrats declined to sign the letter, including both Virginia senators, Mark Warner and Tim Kaine. The other Democrats who declined to endorse the letter were Mark Pryor of Arkansas, Joe Manchin of West Virginia and Joe Donnelly of Indiana. Both Maryland senators — Democrats Ben Cardin and Barbara Mikulski — signed it. Angus King of Maine and Bernie Sanders of Vermont — two independent senators who caucus with Democrats — endorsed as well.